Meet Dirty Bertie: a boy with nose-pickingly DISGUSTING HABITS. 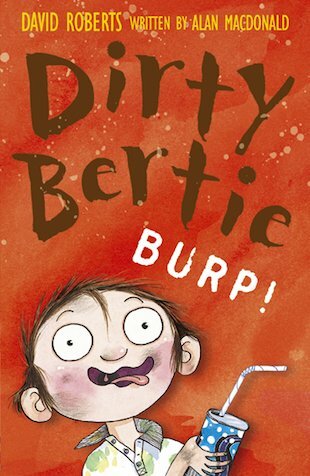 He’s bursting with madcap plans and crazy ideas, and if it’s trouble you’re after, look no further – Bertie’s sure to be up to his neck in it! In fact, right now he’s staging a school dinner revolt, taking Whiffer to dog training and sabotaging his sister’s precious sleepover. It can only end in chaos – or, quite possibly, a horribly loud, juicy BURP! THIS BOOK WAS A GREAT BOOK AND WHEN I FOUND IT AGAIN LAST WEEK I READ IT AGAIN AND AGAIN. Alan MacDonald lives in Nottingham. He writes both non-fiction and fiction as well as writing for radio and TV. He has a particularly good track record for writing page-turning and accessible historical books. Alan MacDonald won the Nottingham Children’s Book Award for The Great Brain Robbery in 2004. Winner of the Stockport and Oldham Book Awards for Jack and the Flumflum Tree.